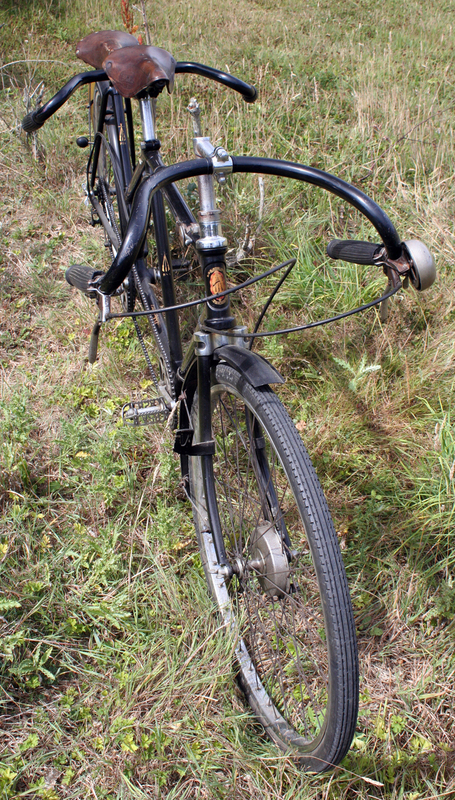 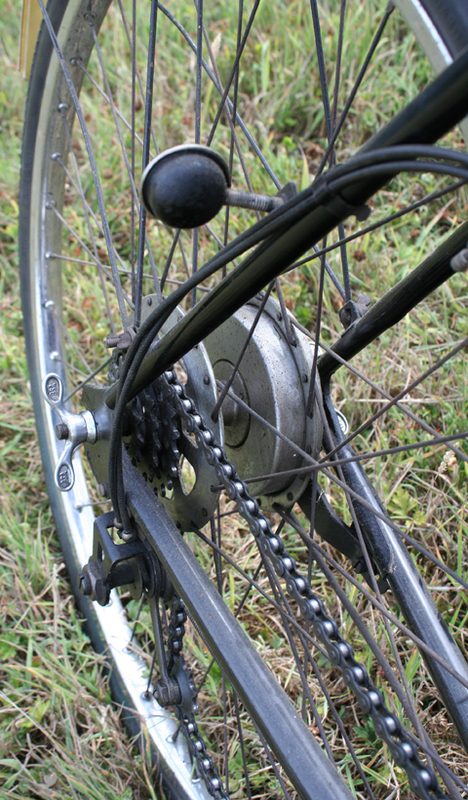 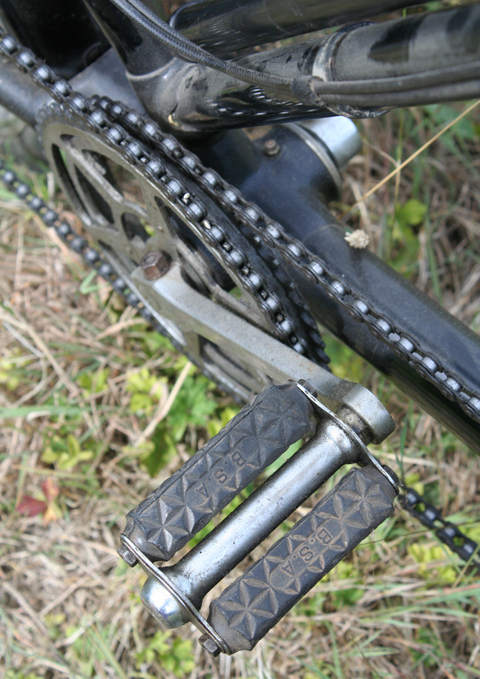 When I started the Online Bicycle Museum http://www.Oldbike.eu in 2007, I did not have many museum quality bicycles. 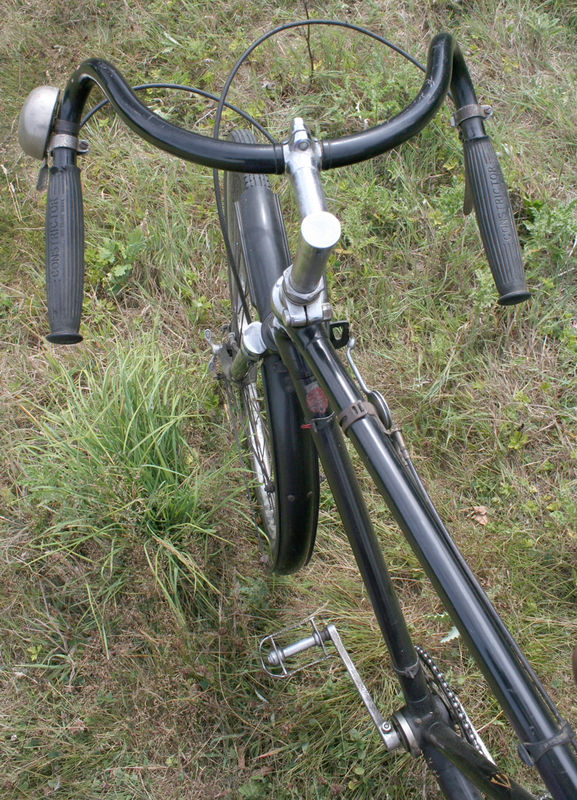 I did not intend selling bicycles either. 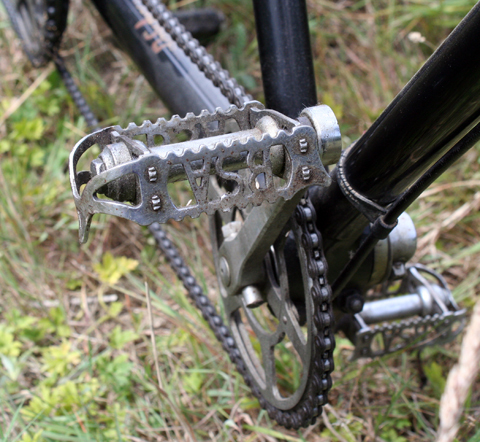 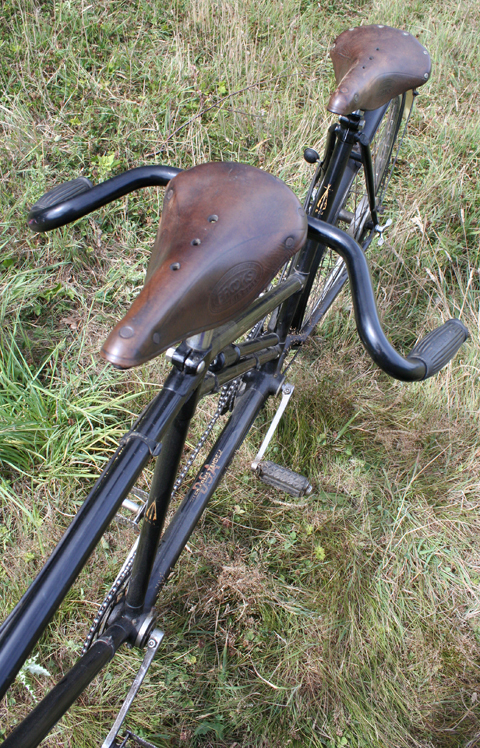 But, within a year, having learned a lot more about vintage bicycles, I was hankering for more interesting examples. 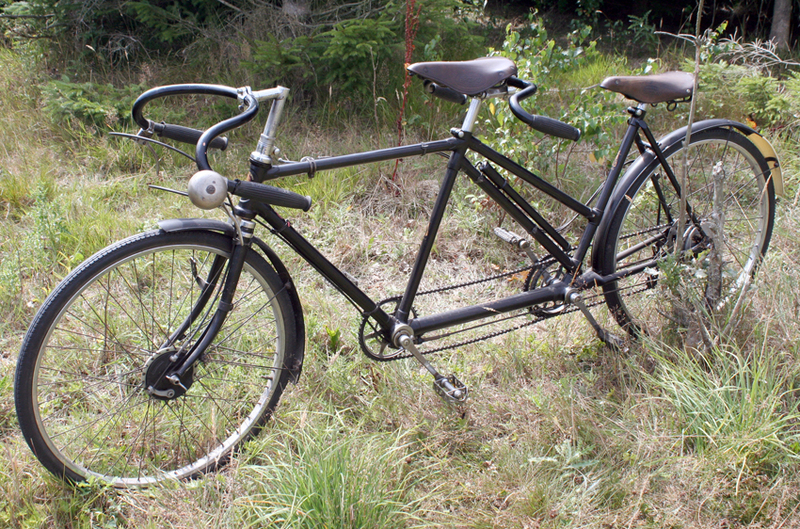 So I started selling many of the bikes I owned in order to replace them with more desirable models. 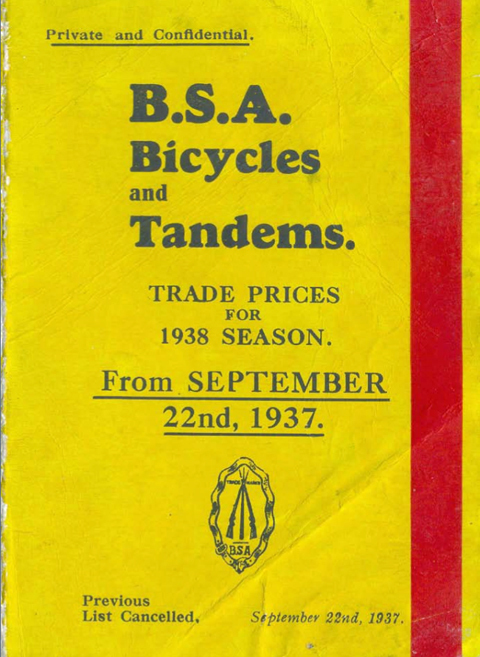 I bought several BSA tandems for resale. 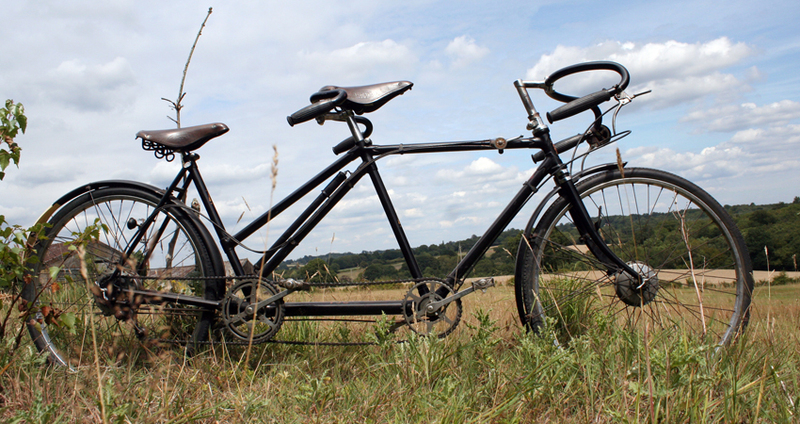 But this one is so gloriously original, I’d be hard put to let it go. 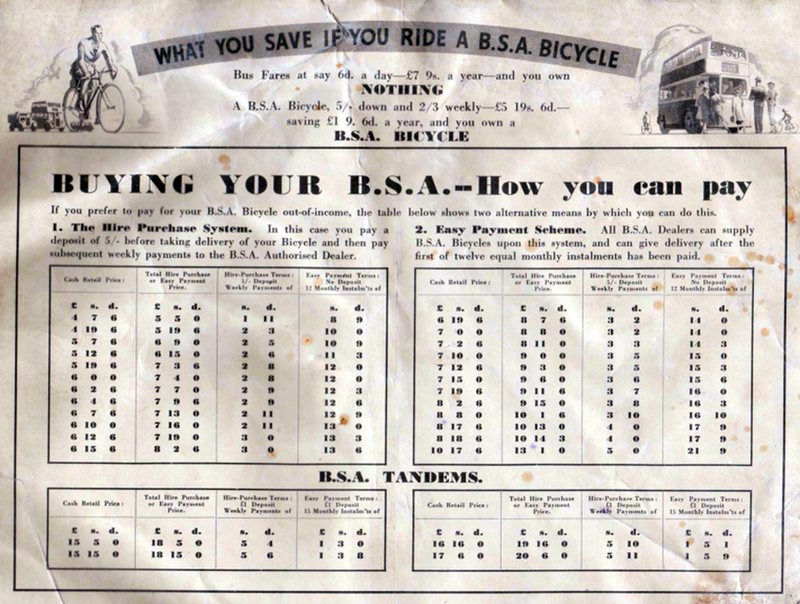 It’s not easy to calculate a BSA’s age from its frame number. 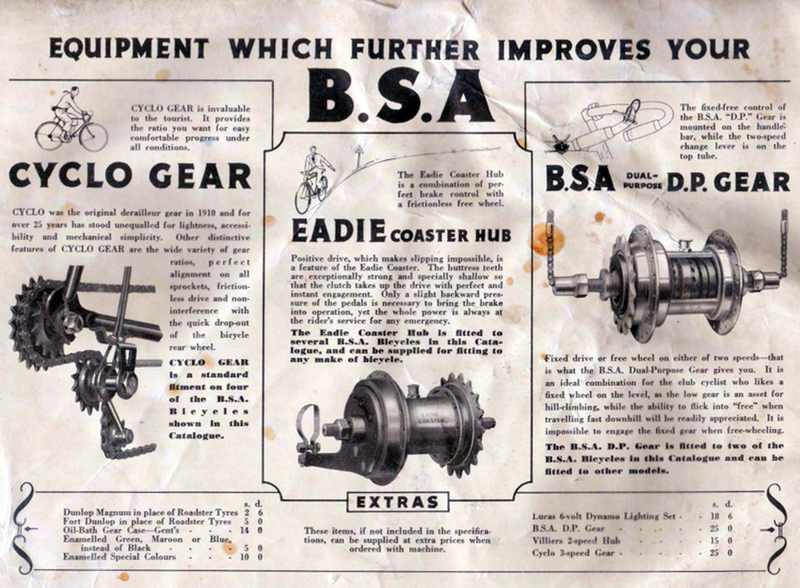 The catalogues offer the best help. 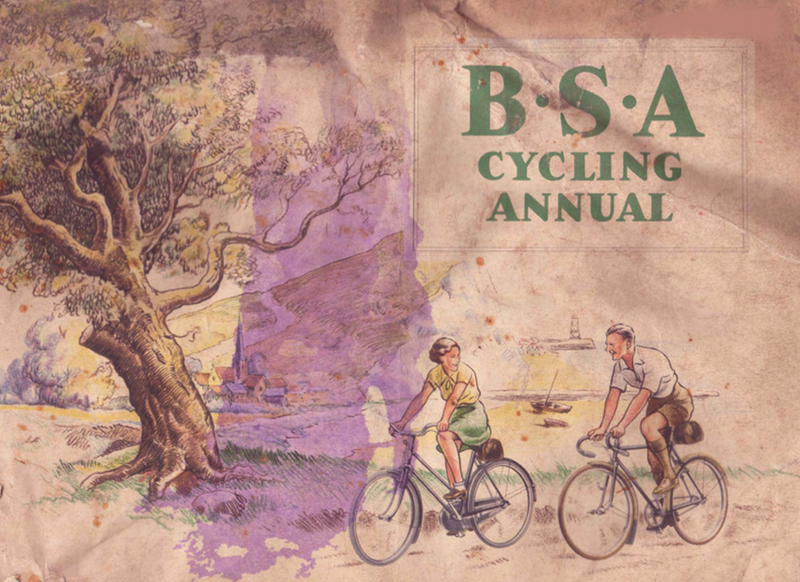 By 1945, BSA tandems evoked memories of a prewar, peaceful England. 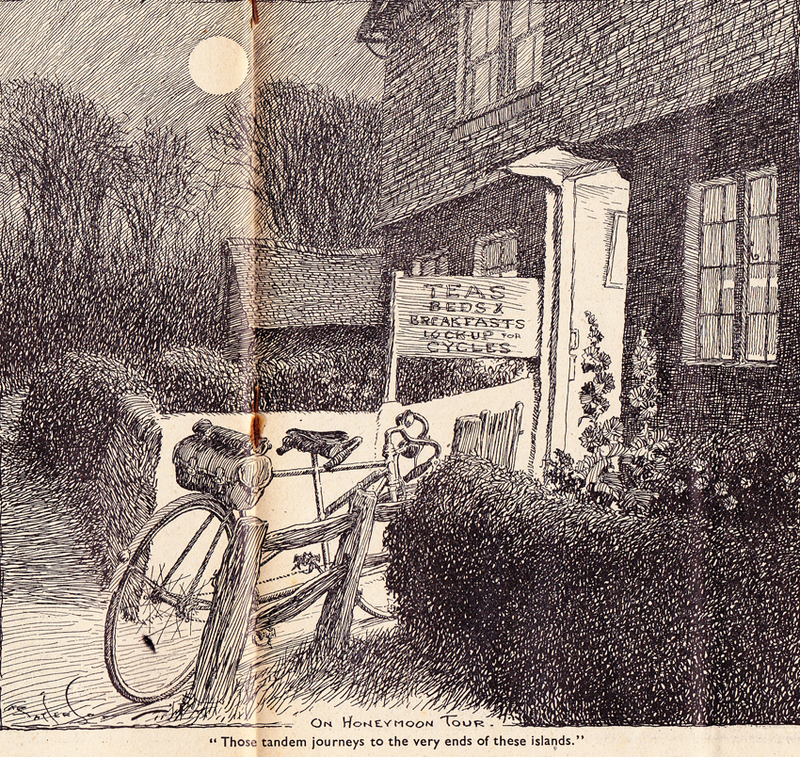 An England where young couples took holidays together, cycling down quiet country roads and staying at b&b’s, hostels or inns. 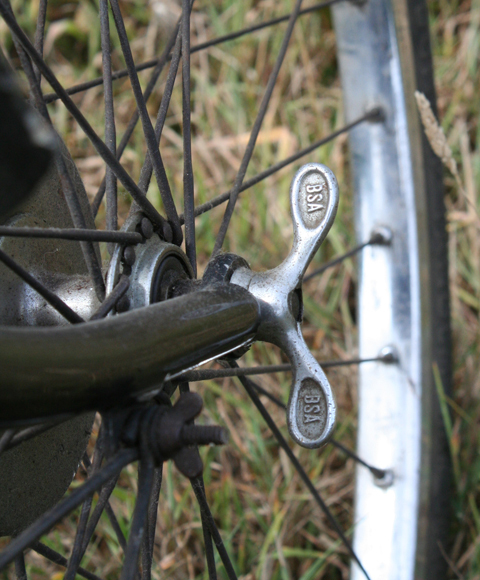 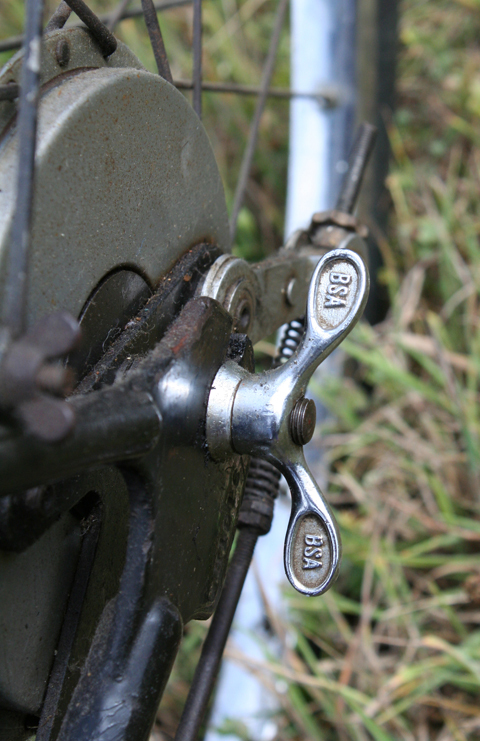 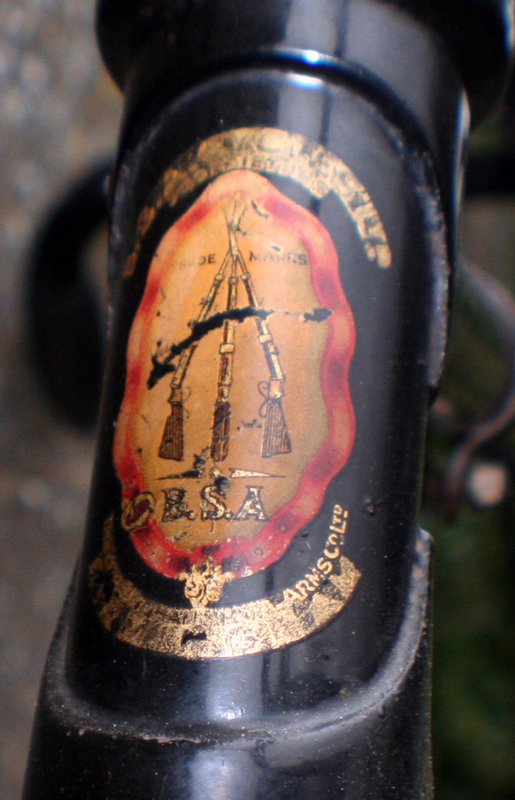 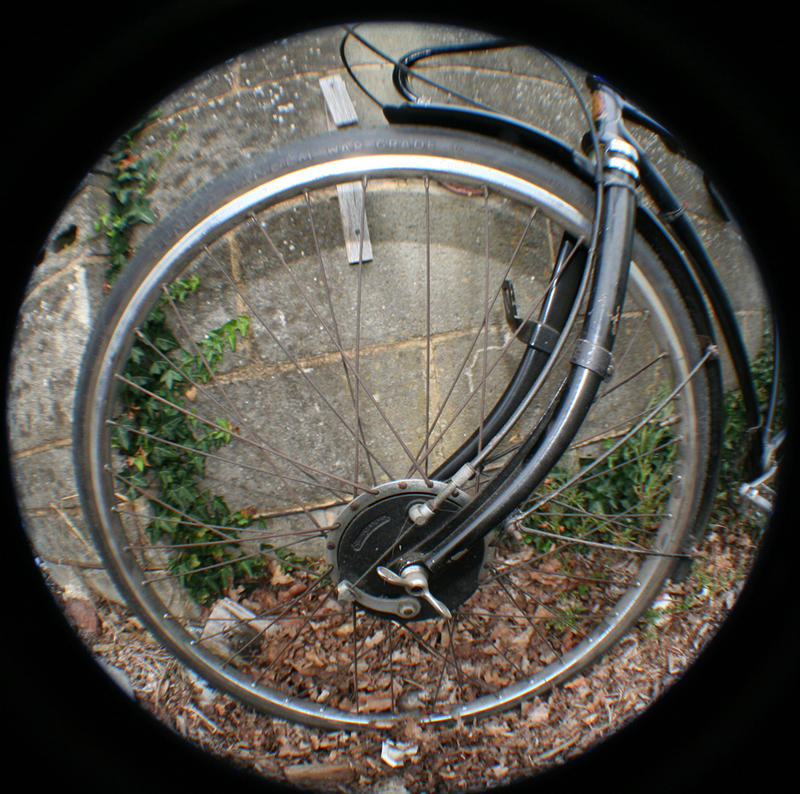 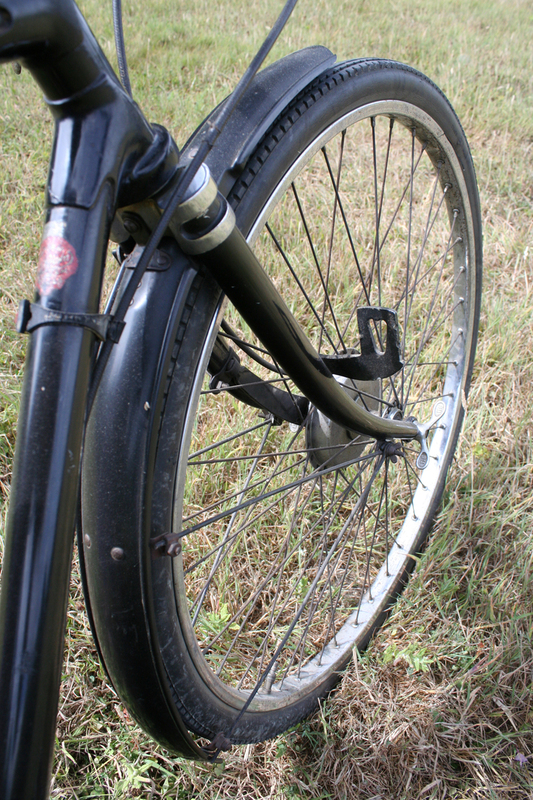 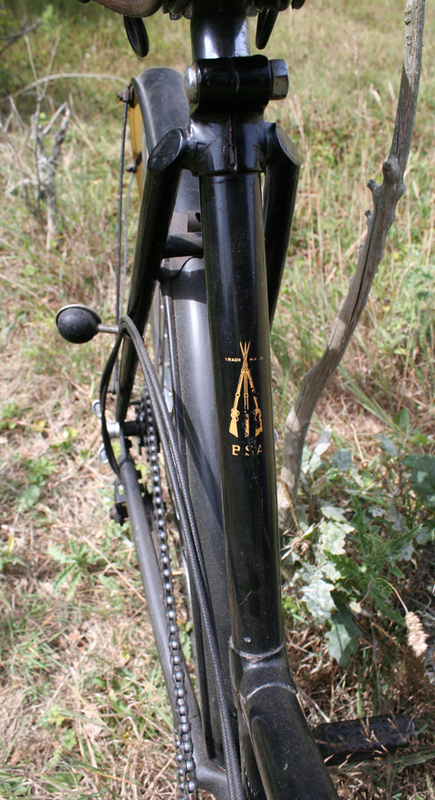 BSA bicycles are notoriously difficult to date accurately. 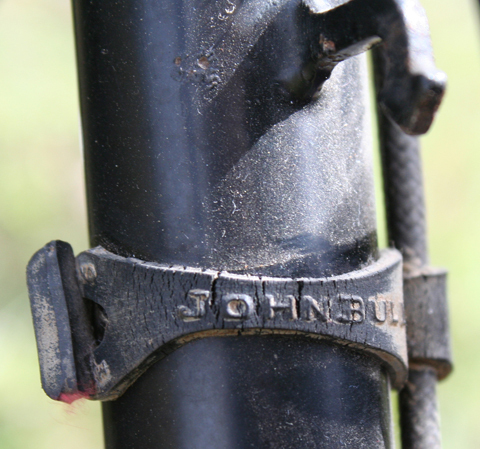 Frame numbers did not run sequentially, and few factory records or shop records exist. 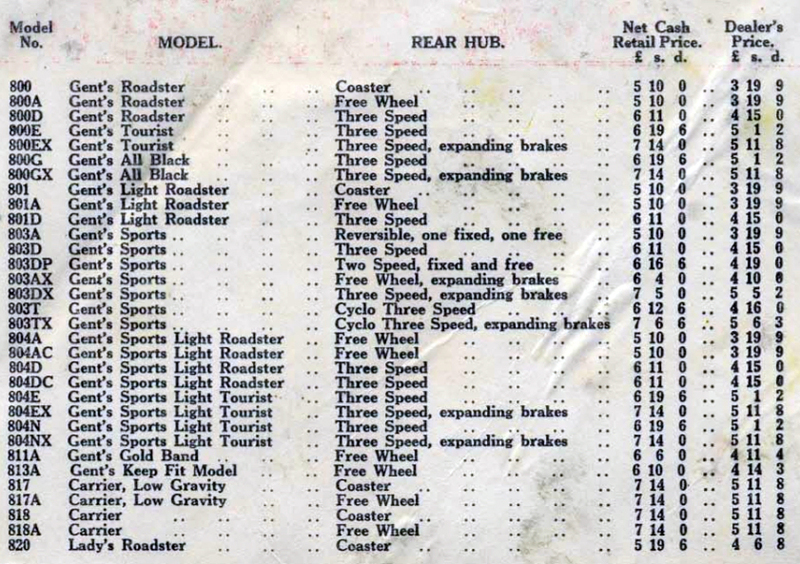 Catalogue descriptions are usually the only way to identify their age. 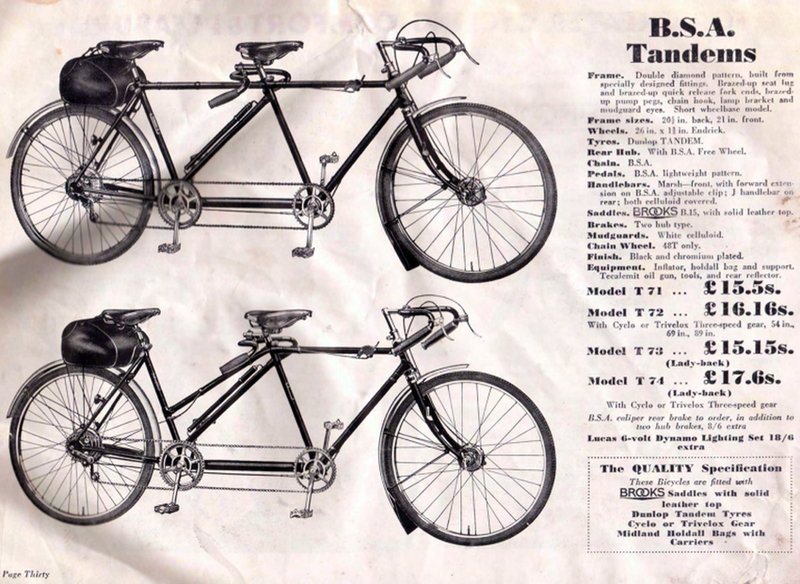 There’s little to distinguish Piled Arms tandems throughout their 1930s model years. 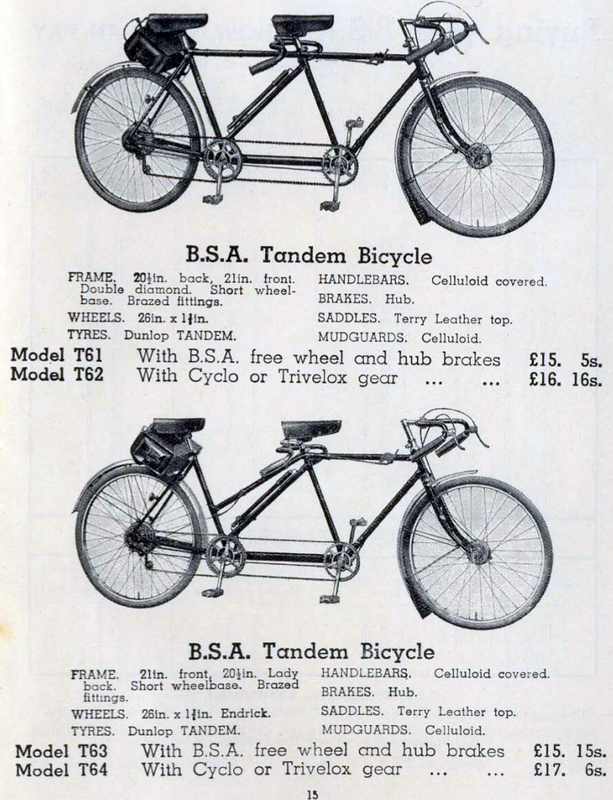 The change of model number from year to year would appear to reflect only the new year’s catalogue model, eg T64 is 1936, T74 is 1937, T94 is 1939. 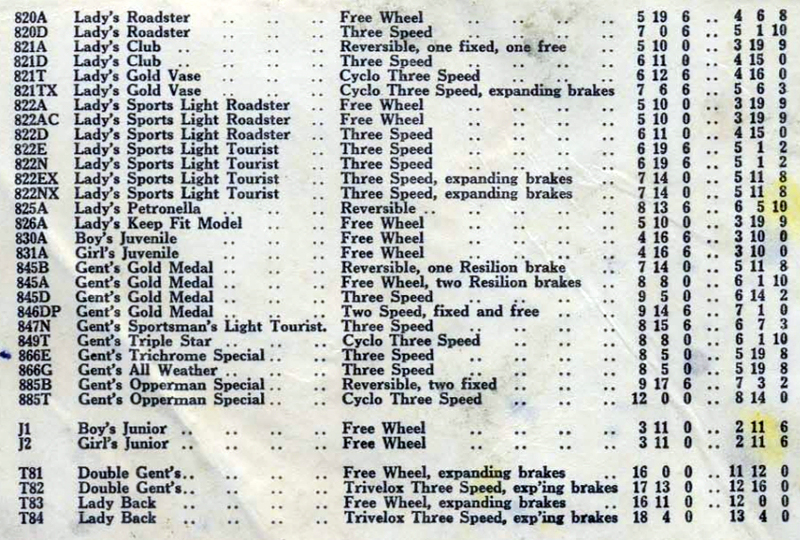 I’ve only spotted a few changes from the catalogue descriptions. 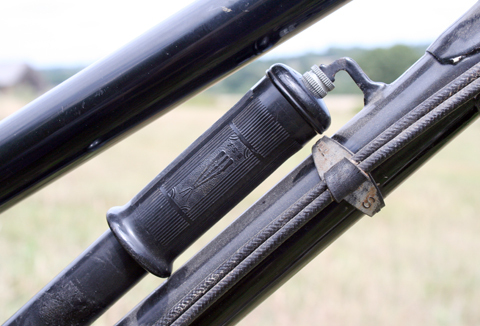 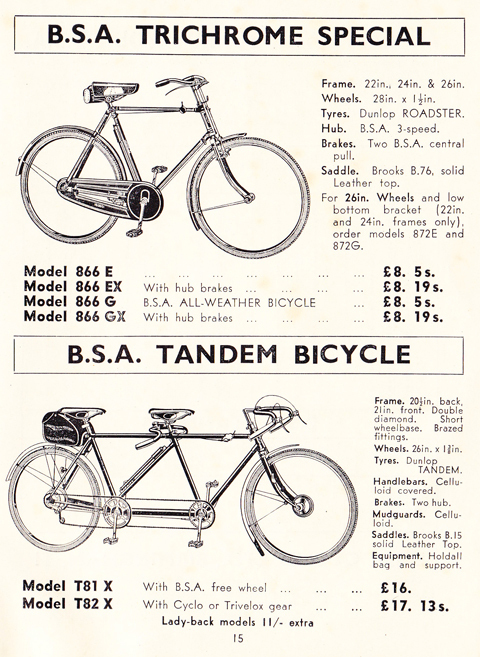 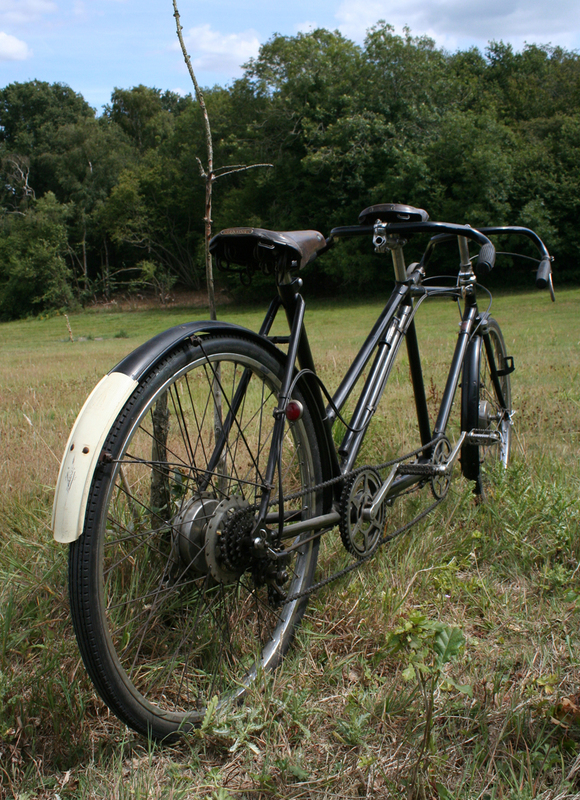 If you compare the catalogues below, the 1934 tandem would appear to be fitted with a different gear trigger to the 1936 model. 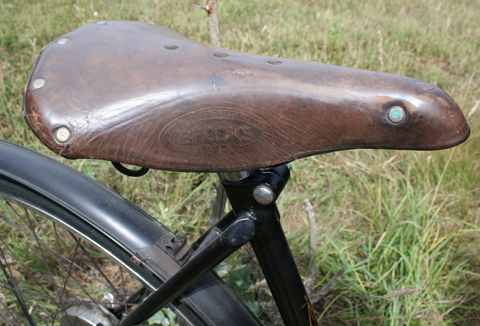 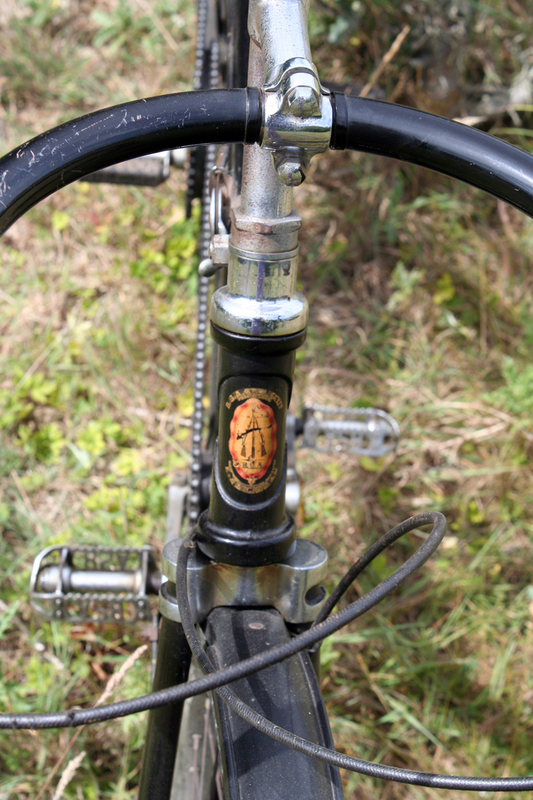 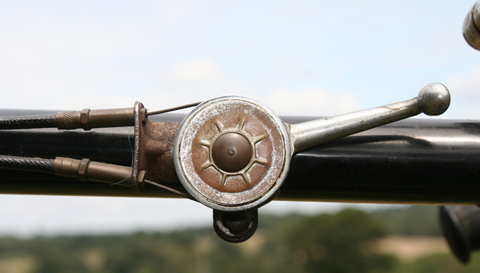 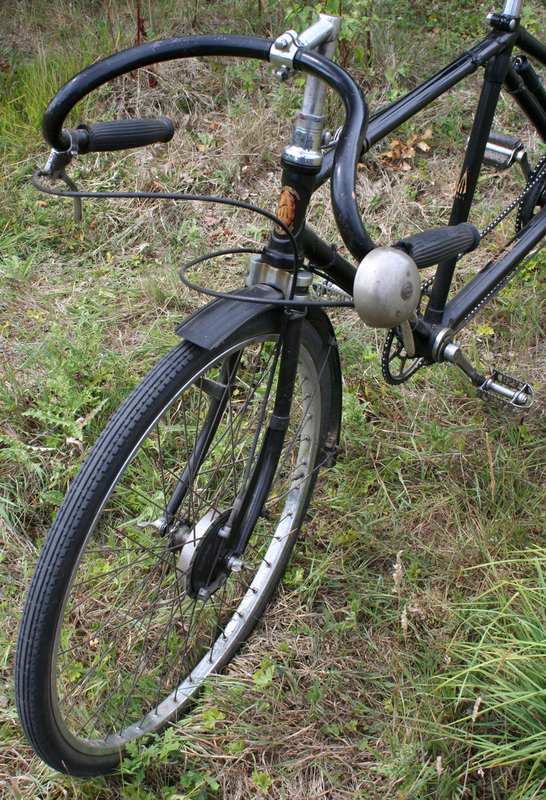 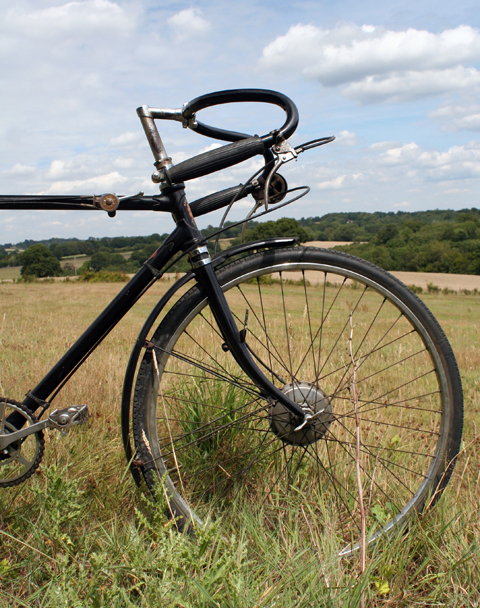 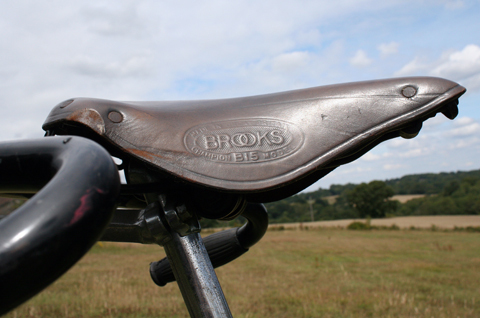 In 1937 the Brooks ‘B15’ saddle was fitted as standard, replacing the Terry Leather Top saddle. 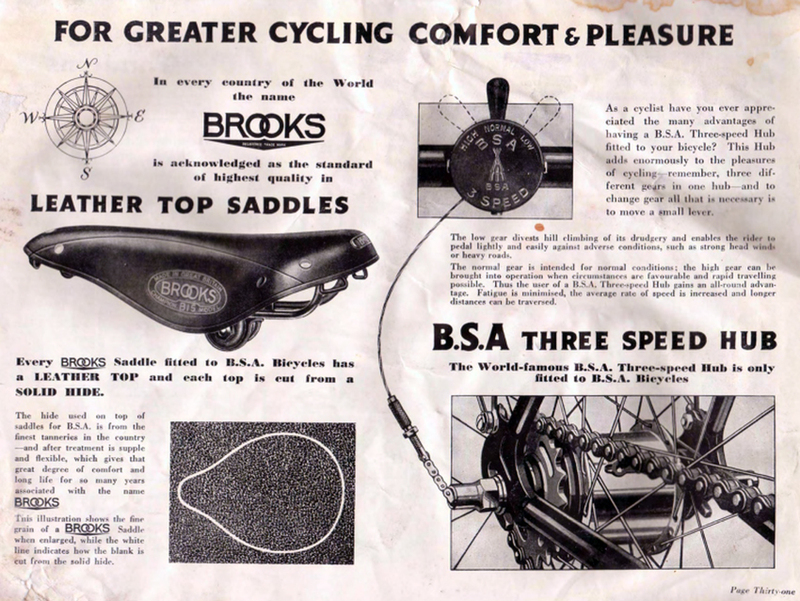 This tandem has Brooks saddles, so I’ve dated it as 1937 accordingly. 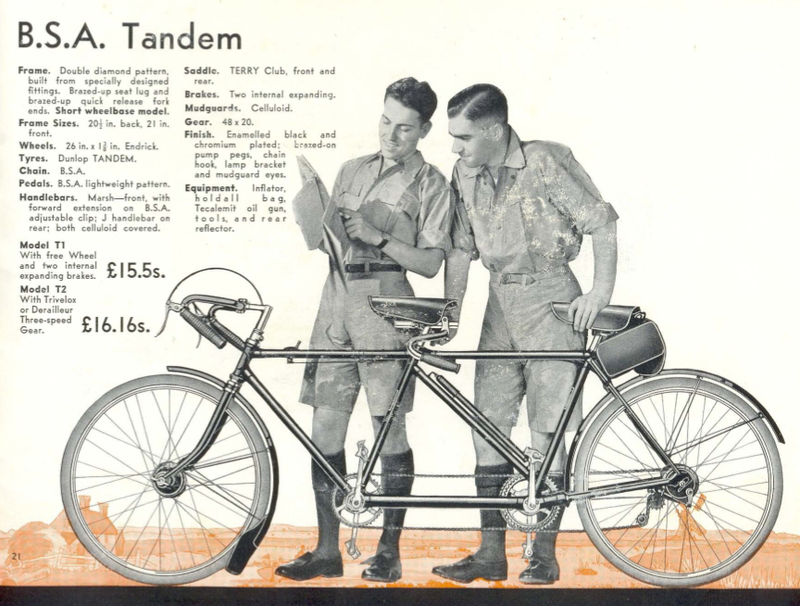 (Of course, saddles can be easily updated, so this tandem might actually be earlier). 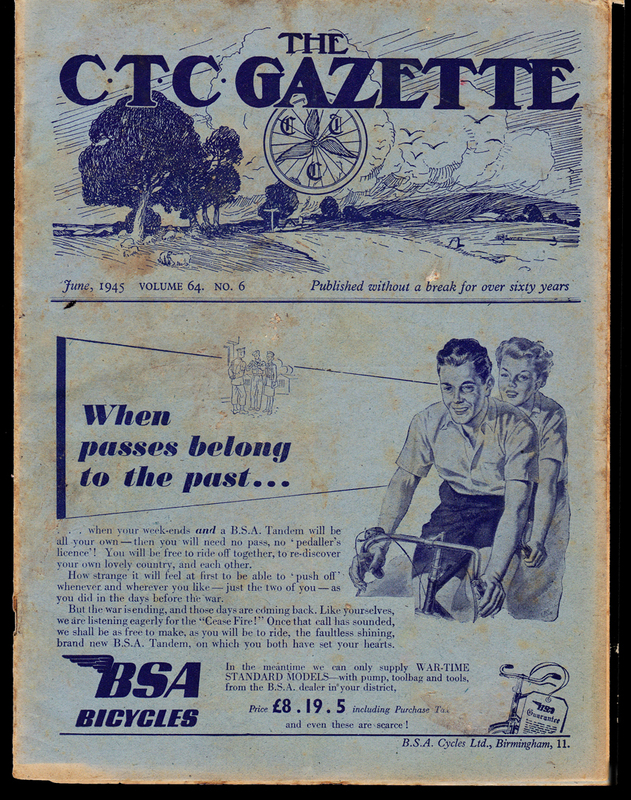 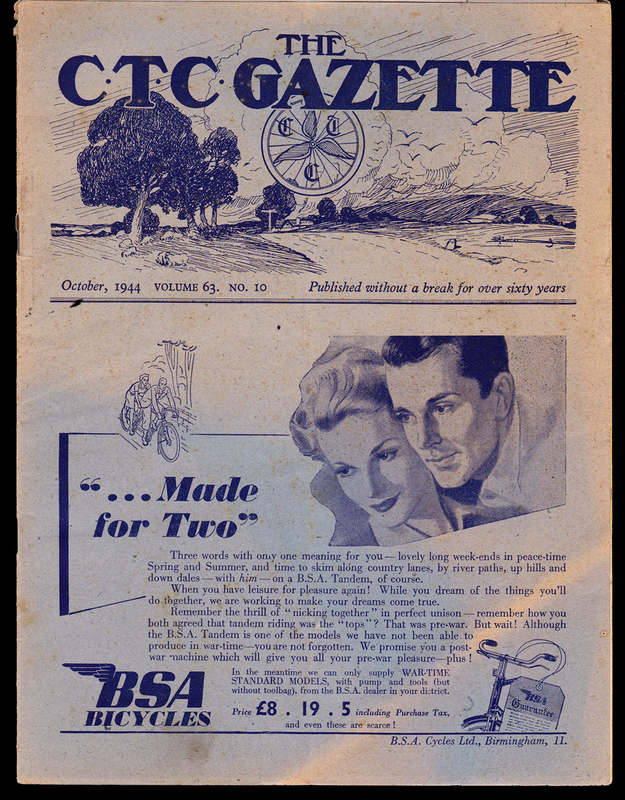 The 1939 catalogue appears to offer only Cyclo gears. 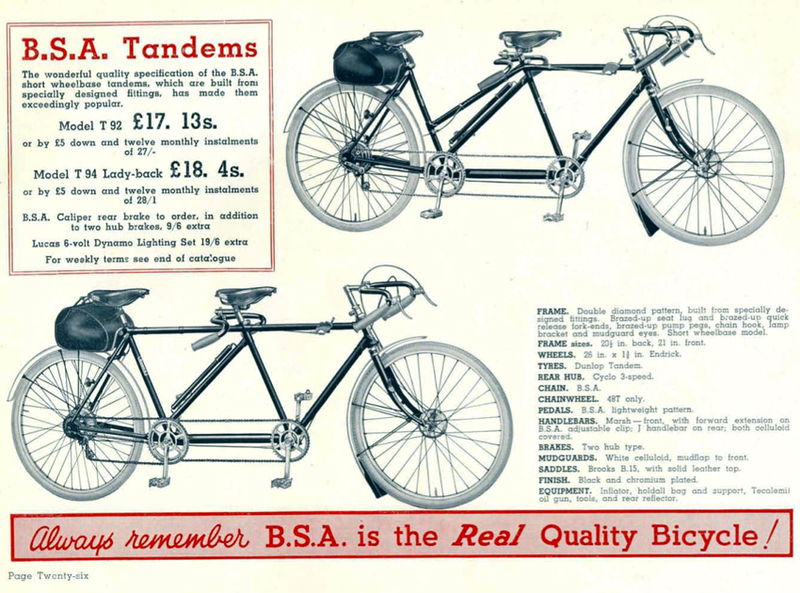 A tandem is not mentioned in the 1940 catalogue, so I assume 1939 to be the Piled Arms Tandem’s final year. 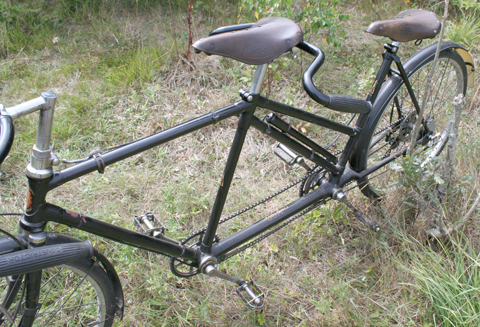 This might become a reference point for these marvelous beasts. 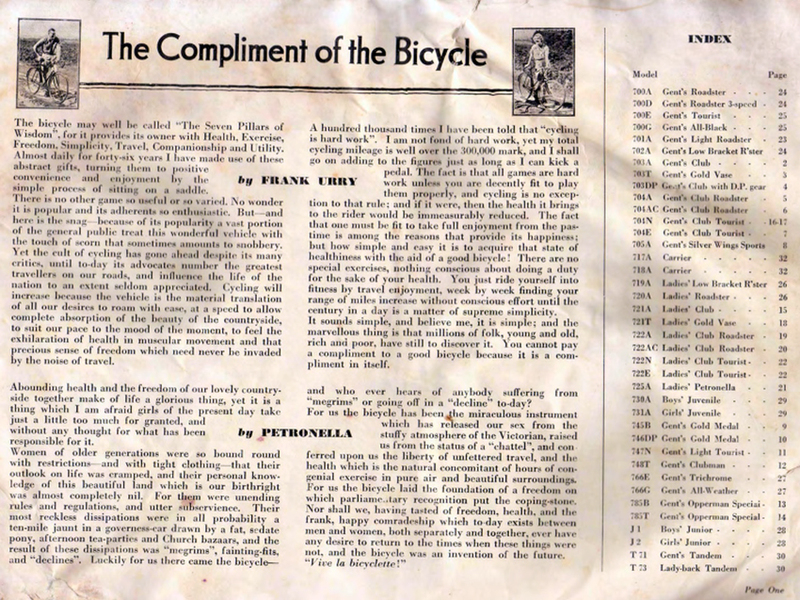 So I’ll continue my research and update this section bit-by-bit as I find out more. 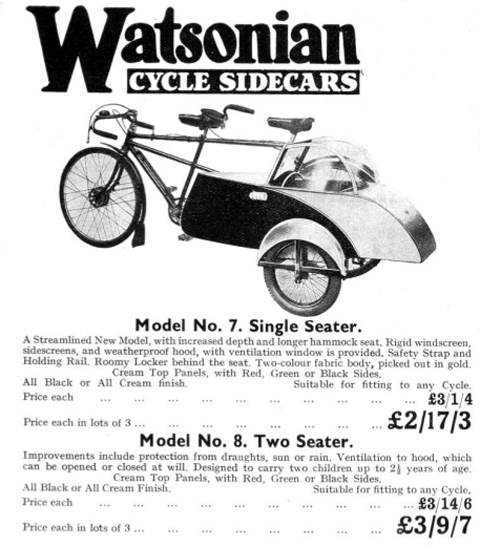 I’ve prepared this double-seat sidecar to fit to this tandem.